Arrr these the BEST pirate jokes? Or the worst? Q: What did the pirate say when his wooden leg got stuck in the freezer? The pirate begins his first trick, and the parrot gives it away by saying "rawwk, the coin is in the other hand, rawwk!" Frustrated, the pirate tries another trick, but again, the parrot gives it away by blurting out "rawwk, look under the table, rawwk!" This goes on for some time, to a point that the pirate can't manage to perform anything spectacular to entertain the crew. His anger towards his blabbermouth parrot eventually grows so phenomenal that one night he gets very drunk and accidentally crashes the ship into some rocks. "Rawwk, Okay, I give up, What'd ya do with the boat?" Q: What do Jewish Pirates say? Q: Why did the pirate buy an eyepatch? A: Because he didn't have enough money for an iPad!!! Pirates get a bad rep. They're not all bad.Granted, they're not saints, but many have been cannonized!! Q: What is a pirate's favorite element? A: Aye. Ye might say aarrrrgon, but no, it's the element of surprise! A: You think it's the RRRRR, but it's the C that they're in love with! That's not true. They do cry, but when they do, it's a private tear! Q: What happened when Bluebeard the Pirate fell into the Red Sea? Q: What do you call a stupid pirate? Did you know 3.14% of Sailors are Pi Rates? 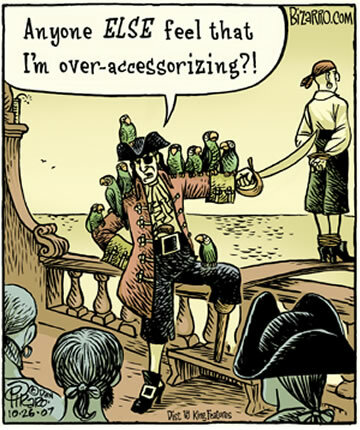 A pirate had a parrot that wouldn't stop swearing. He tried everything. Finally one day, when the parrot started swearing, he threw it into the freezer and left it there for over an hour. Finally, the pirate retrieved his parrot from the freezer. The parrot came out, shaken, and said "I promise, I'll be good from now on. But, I have just one question... What did the turkey do?????" I hope you enjoyed the jokes. Now where did I put my keys? Oh, that's right. I left them off the coast of Florida. For the mathematicians: Did you know that out of every 22 Sailors 7 are Pi Rates?